If you like playing slots linked to huge progressive jackpots and being sure of receiving a reward then head over to Betfred Casino this weekend. From now until midnight on Sunday you can earn double comp points when you play the exciting slot Age of the Gods: God of Storms. Instead of needing to bet £10 to get a comp point you will get one for every £5 bet on the game. As a result it’s a great chance to collect as many comp points as possible and climb your way up Betfred Casino’s loyalty ladder. 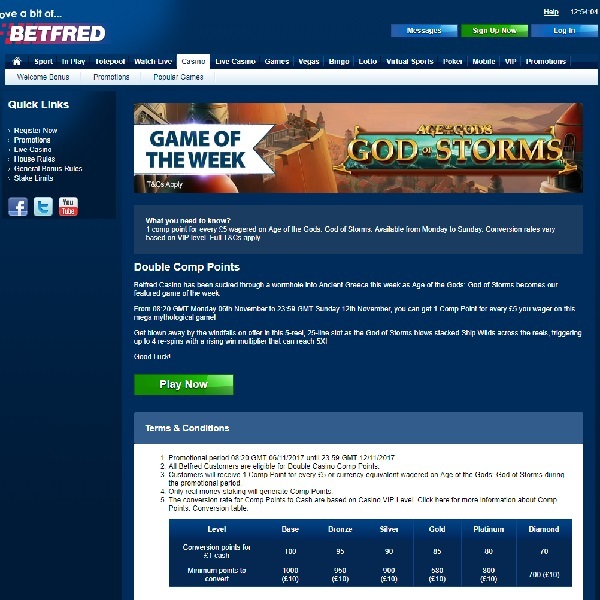 Age of the Gods: God of Storms features a rewarding bonus game featuring free respins and multipliers. Furthermore, it is linked to four progressive jackpots so while you collect comp points you could win an absolute fortune. Head over to Betfred Casino today and set the reels spinning.